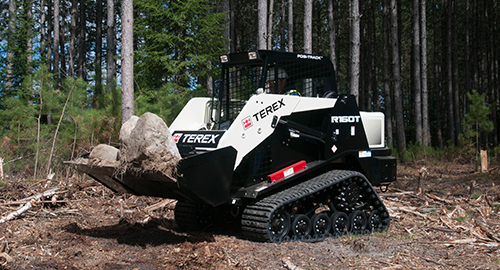 Featuring an electronic, 4-cyclinder turbocharged Perkins diesel engine, the new 71-hp Terex® PT-75 compact track loader is the newest member of the company’s line of Tier 4-interim compliant compact construction equipment. 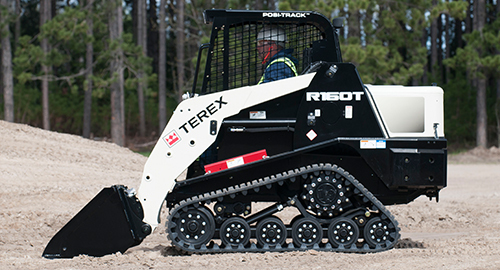 Boasting a narrow machine width (70-in), the Tier 4i PT-75 can easily maneuver and operate in confined or congested work sites, making it an ideal loader for landscapers and general contractors. 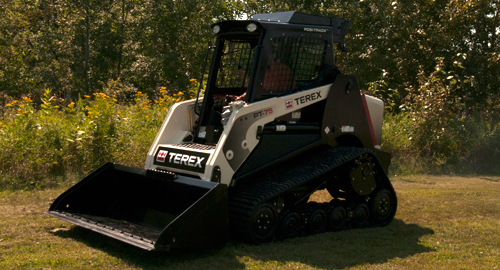 Its purpose-built chassis is designed to be a heavy-duty machine within a compact package. Low-flow auxiliary hydraulics from 0-17.4 gal/min, high-flow auxiliary hydraulic capability of 30 gal/min @ 3,000 psi. Multiple levels of suspension that distributes the machine’s 8,972-lb operating weight down to only 3.5 psi of ground pressure. 178.5 ft-lb of peak torque, a tipping load of 6,200 lb — with a 3,100 lb operating capacity at 50 percent tipping load capacity. Optional two-speed hydrostatic drive system that allows operators to select low for maximum torque or high for faster travel speeds up to 10.5 mph. Optional 20-in tracks for increased versatility to keep operators working year-round, even in wet, muddy or snowy conditions. 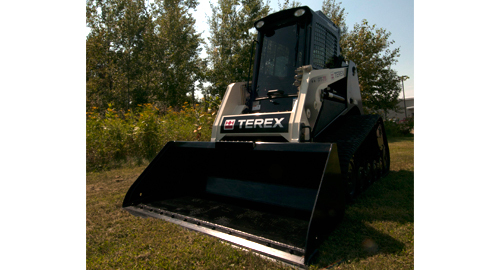 The Terex® R160T radial lift path compact track loader is a high performance compact track loader with exceptional power and versatility ideal for construction, landscaping, utility and private owner applications. This unit offers operators 105 ft-lb of peak torque, a tipping load of 4,574 lb — with a 1,600 lb at 35 percent of tipping load capacity (2,285 lb operating capacity at 50 percent tipping load) — and a lift height of 115 in. 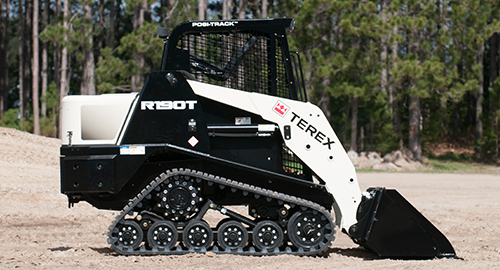 The R160T features the Terex patented Posi-Track™ suspended undercarriage technology and two-speed drive motors. As a result of this technology, the machine’s 6,200-lb operating weight is distributed down to only 3.5 psi of ground pressure, producing incredible traction and low ground disturbance. This set-up gives the R190T loader more traction, higher flotation and better operating comfort so operators can make full use of the machine’s higher travel speeds, up to 8 mph. A choice of general purpose, turf (smooth) or extreme terrain track options are available for this model to assure maximum versatility and productivity on all ground conditions. Radial lift path loaders, like the R160T, have only one pivot point at the rear tower, allowing the loader to have a radius arch from ground level to full height when raising the boom. This configuration works better for ground engaging tasks because of weight distribution between the tracks. These attributes make a radial lift path loader a premium digging and grading unit. A loader-mounted quick-attach interface gives the R160T the versatility of using virtually any industry-standard attachment. 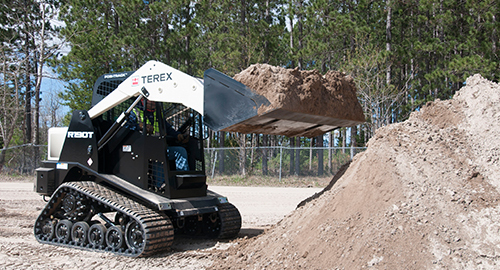 The Terex® R190T radial lift path compact track loader offers operators 140 ft-lb of peak torque, a tipping load of 5,430 lb — with a 1,900 lb at 35 percent of tipping load capacity (2,715 lb operating capacity at 50 percent tipping load) — and a lift height of 115 in for powerful production in digging and grading applications. The radial lift path configuration on the R190T excels in ground engaging tasks because of weight distribution between the wheels. The weight distribution on a radial lift path is almost an even split between the front and rear of the machine, improving tractive effort and giving the unit better cutting edge pressure. 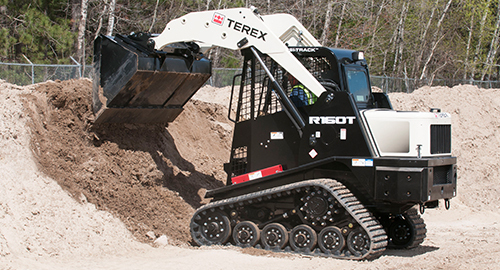 Because of this set-up, radial lift path units like the R190T will excel at spreading rock, grading, and site prep. These models also offer more reach at flatbed height to unload pallets. 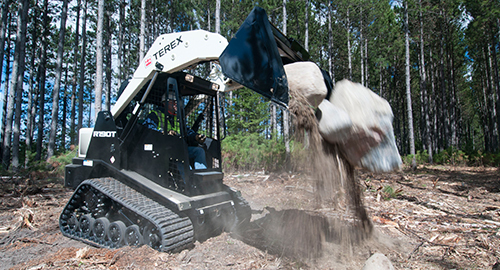 The R190T compact track loader is equipped with the Terex® patented Posi-Track™ suspended undercarriage technology that maximizes traction and flotation while giving operators the most comfortable ride possible. As a result of this technology, the machine’s 6,930 pound operating weight is distributed down to only 3.9 psi of ground pressure. This set-up gives the R190T loader more traction, higher flotation and better operating comfort so operators can make full use of the machine’s higher travel speeds, up to 11 mph. 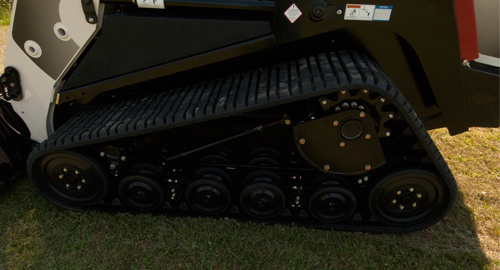 Optional smooth Turf Tracks or Extreme Terrain Tracks with aggressive treads are also available for this model. 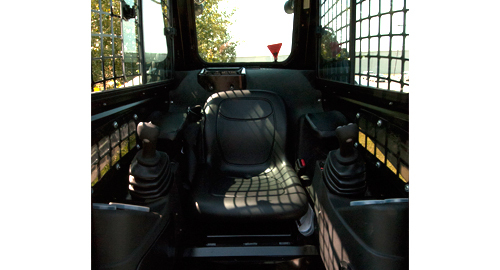 Operating the R190T unit is easy with pilot-operated joystick controls and a load-sensing hydraulic system that helps prevent engine stalls.